The Union Home Minister congratulated Agnihotri on the book, which is a result of his research on urban naxalism. They also shared ideas on how to fight India's internal security threat. MUMBAI: Filmmaker Vivek Agnihotri, who has made his debut as an author with "Urban Naxals", met Union Home Minister Rajnath Singh earlier this week. He says he must have done something right as it isn't easy to grab the government's attention. 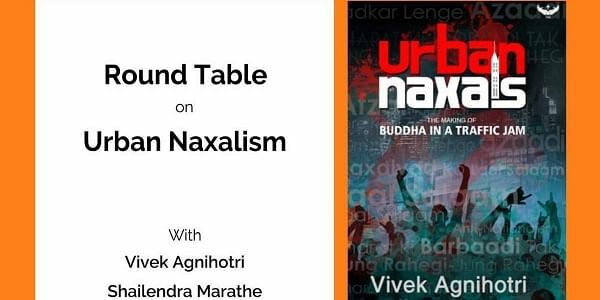 According to Agnihotri, Singh congratulated him on the book, which is a result of his research on urban naxalism. They also shared ideas on how to fight India's internal security threat. Of the meeting, Agnihotri said in a statement: "I consider this as a great honour to be sitting across the coffee table and discussing my book at his residence. It is not easy to attract eyeballs from the government, that too from the centre... I must have done something right. "We had a very lengthy chat and there were plenty of takeaways from this meeting but what put a smile to my face is the fact that he patted me for the courage and my attempt to speak up regarding this deep-rooted issue." In the book, Agnihotri talks about the subtle forces at play both in the film industry and society at large, which corrupt, influence and coerce the masses into thinking and acting in a certain manner.